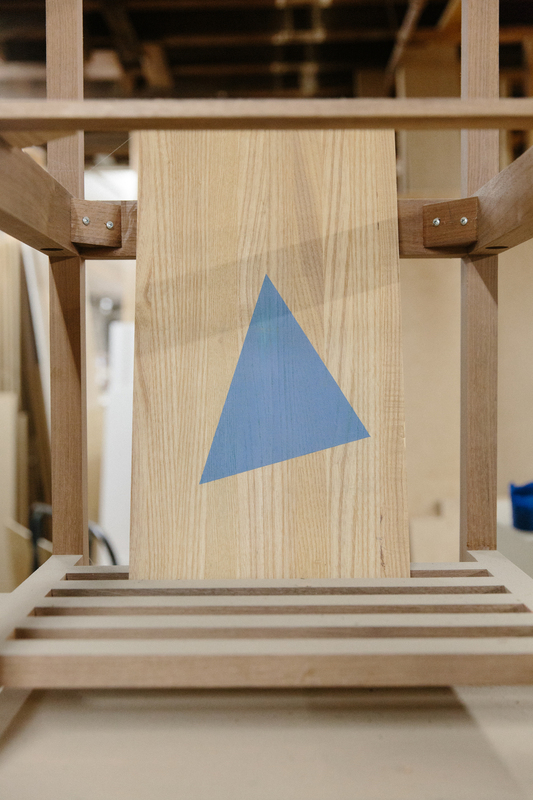 While furniture has always been a part of his family’s history, Brian Volk has forged a path to discovering a design language that is entirely his own through art, music and fabrication. Now with a newborn son and a growing demand for VOLK designs his promise “that future generations will treasure the simplicity, care and craft embodied in each piece” seems more relevant than ever. 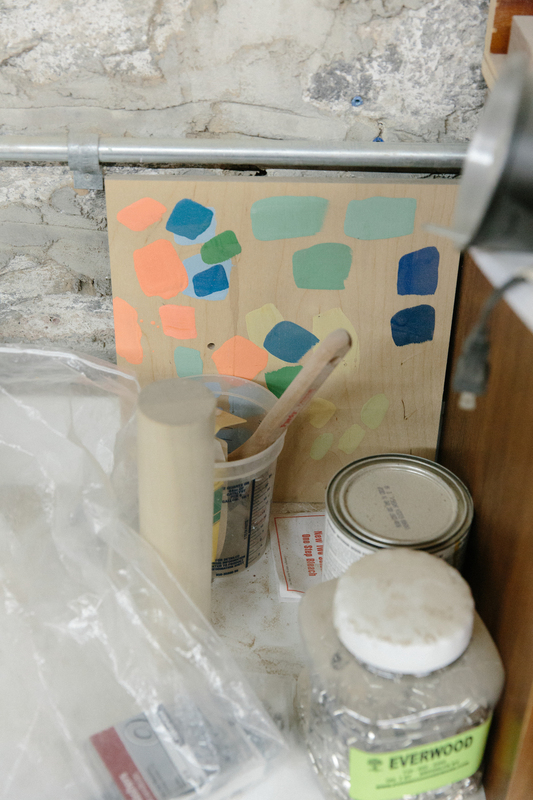 You studied at RISD and it sounds like before furniture and design you were a musician and a fine artist. Can you tell us a little bit about that? I studied painting at RISD and still continue to paint, although with VOLK growing quickly I am unfortunately finding less and less time these days. Music has always been a focus in my life since I was really young. I have played in bands and wrote and recorded music since I was 12. After graduating RISD I lived in San Francisco for a year and a friend and I began to focus on music a bit more seriously - putting together a demo and eventually getting signed. We then moved back to New York, played in bands and even ran a small record label for the better part of a decade. It wasn’t until I started VOLK that music began to play more of a background role in my life. Playing music for all those years was definitely a good way to spend your twenties and actually some of the mistakes that were made with the record label have helped me with the business end of VOLK. I know that there is a deep family history that you have with furniture. When did you become aware of this and is it what sparked your transition to design and the founding of VOLK? I was aware of the chair maker (my great-great-great-great grandfather) in my family history from a fairly young age because we had several of his rush woven side chairs throughout the house that I grew up in. However I never really considered the significance until after I started VOLK. I grew up on a farm that my family has lived on for many generations - in a house built by my ancestors - so that was the dominant theme when learning about my ancestry. After starting to make furniture myself though, I certainly became more interested in the chair maker and his factory in a nearby town and began to consider the significance of his history as it related to my own. As VOLK has evolved it’s come to represent a very distinct contemporary style. In terms of directing this evolution has it been based around making sure your work is unique within the marketplace or is style something that you feel comes more intuitively regardless of the competition? The style of the VOLK brand has evolved significantly since its start 4 years ago as I have grown as a designer and learned to better trust my own instincts. 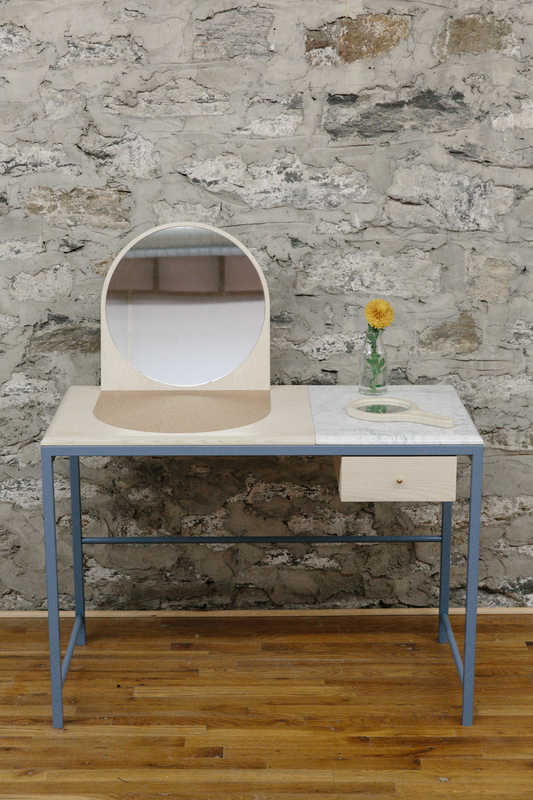 Even though I have a background in fine arts, I entered the design world through fabrication - learning how to build furniture working in a cabinet shop in the Brooklyn Navy Yard for 5 years before starting VOLK. My first products definitely leaned on my earliest influences – namely mid-century furniture - but as I evolved and became more confident as a designer the collections grew increasingly representative of my tastes and reflected a more individual point of view. I certainly want VOLK to be a unique brand in a crowded and competitive field, but I don’t believe in making choices based on the marketplace — even consciously avoiding something on trend is letting the market dictate the design. Some of my favorite VOLK pieces are hardly best sellers though, so perhaps the marketplace disagrees with me sometimes! So while the latest VOLK designs are to this point the most representative of my point of view, the process of design (like most things creative) is a search, and I hope to always be searching and evolving, so the VOLK style will probably be much different 5 years from now…. 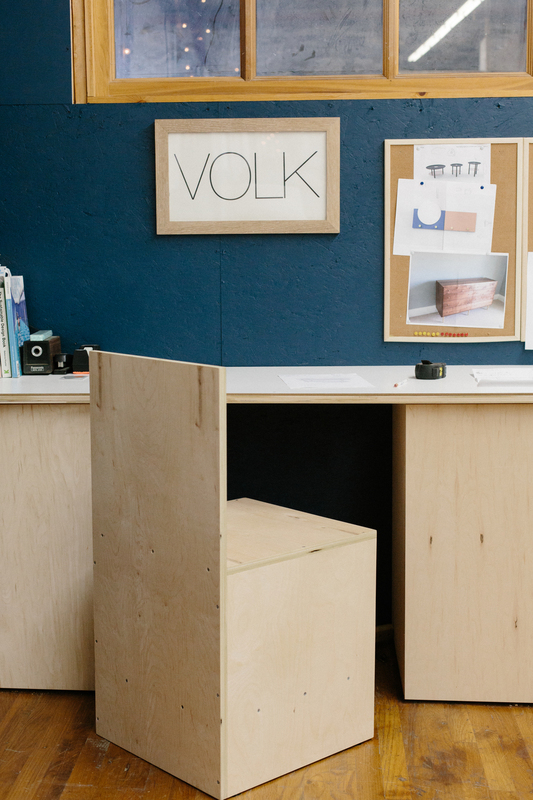 VOLK began, as many independent design companies do, making all of its products in-house, out of your shop. As you’ve developed and become a business and a brand what are you thoughts on how you want to see things grow? I am lucky enough to say that VOLK has grown tremendously in its first 4 years, but not lucky enough to be able to say that I expected or even planned for it to happen as it has. Growth is every designer’s goal but I think it needs to happen organically and probably have more to do with reaction than planning. That is how it has been for VOLK so far. On the technical side, a large increase in orders has led me to develop a good network of shops to outsource to and more importantly, led me to begin to design more part-based furniture. Outsourcing parts rather than the whole leads to less time spent on each piece while maintaining the ability to control the quality of what is being fabricated. As far as short term goals, I hope to be able to bring production of our entire catalog back in-house within the next year or two, grow the shop and devote more time to marketing and outreach. The long-term goal is to simply keep the brand evolving and to be in a position to take advantage of all interesting opportunities that present themselves as we move forward. You just had a baby earlier this year, so firstly congratulations on the new member of the family. Since you’ve had a child in what ways has this influenced your design and your practice? Thank you! The birth of my son Sebastian is definitely the most important thing to happen in my life so far. Other than the lack of sleep being a probable safety hazard in the shop! His existence has really put everything into perspective for me. Leading up to his birth I figured that having a child would inevitably create more financial stress for my wife and I and that I should really “buckle down” and probably figure out how to run a more efficient business — how to market the brand better and so on. However, I feel like the opposite has happened. I am now finding more satisfaction in what I do — rather than the anxiety that often accompanies growing a business and being a competitive person in general — and have been able to better appreciate how lucky I am to work where I do and to be able to design and produce furniture for a living. This clarity probably won’t last forever — as someone who probably puts far too much pressure on themselves to succeed — but for now it has been a revelation!